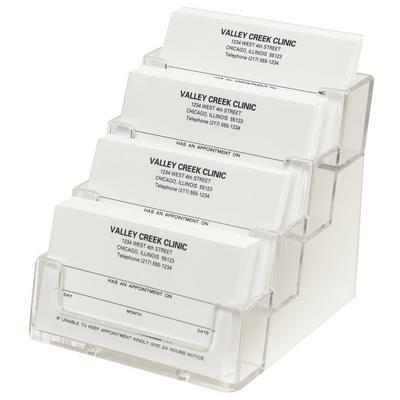 4-, 6- or 8-pocket holder displays business and appointment cards neatly, even in a small area. Made of acrylic and holding approximately 50 cards per pocket, it’s an excellent way to get your name out there. 4-pocket holder: 4" w x 3-3/4" H x 3-1/2" D.
6-pocket holder: 7-1/2" W x 3" H x 3" D.
8-pocket holder: 7-7/8" w x 3-7/8" H x 2-5/8" D.
Pockets: 3-5/8" W x 3/4" D.